I received an email message from Beth Larkin, who is a Vice President at the HNTB Corporation in Boston, last March. She is a Professional Engineer and is also a UMass Amherst engineering alumna. She is a colleague of Ted Zoli's, who is the Chief Engineer at HNTB and is a MacArthur Foundation genius grant recipient. Beth had reached out to him to get a recommendation as to who may be a good speaker on Big Data and transportation in the near future for the ACEC (American Council of Engineering Companies) Boston Conference and he recommended me - what an honor. ACEC is an organization that represents the business interests of the engineering consulting industry. Beth also wrote in her message to me that this industry is: An industry that desperately could benefit from hearing from women thought leaders. Beth is an ACEC/MA Past President and part of a group of women who are trying to get more of the sessions to include women both as presenters / panelists and moderators. 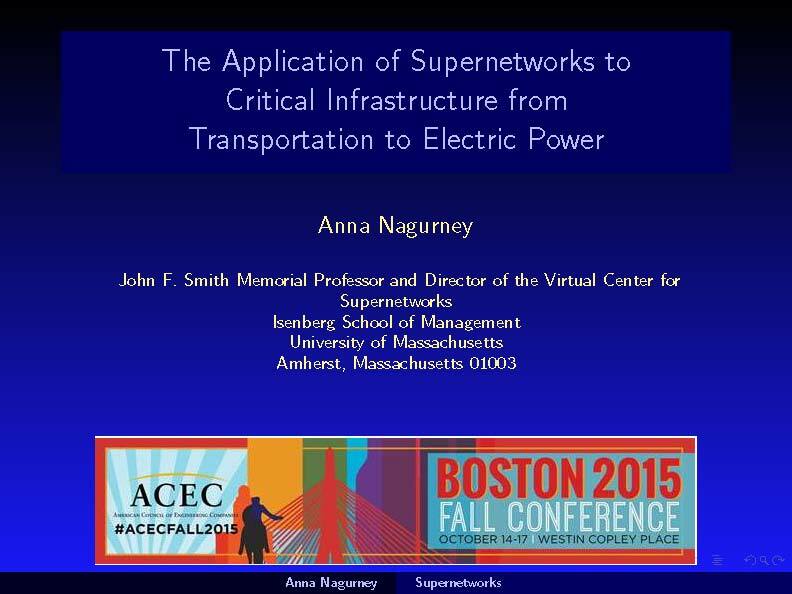 Such an invitation was impossible to refuse and I am delighted to be speaking at the ACEC Fall conference, which takes place in beautiful Boston, October 14-17, 2015. I will be speaking on Friday afternoon, October 16, 2015, in an Educational Session. My presentation is ready and it had to be emailed to ACEC in early September since copies will be distributed to the audience. The expected attendance is 800 people with not all going to each session, of course. It is great to be representing the Isenberg School of Management and UMass Amherst in this way. The conference brochure is here. The keynote speakers are: Doris Kearns Goodwin, who will speak on "Leadership Lessons from the White House," and Dr. Robert Ballard, the discoverer of the Titanic. 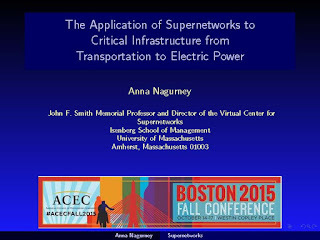 Looking forward to a fabulous conference and so glad to have an opportunity to speak on our supernetwork and critical infrastructure research. 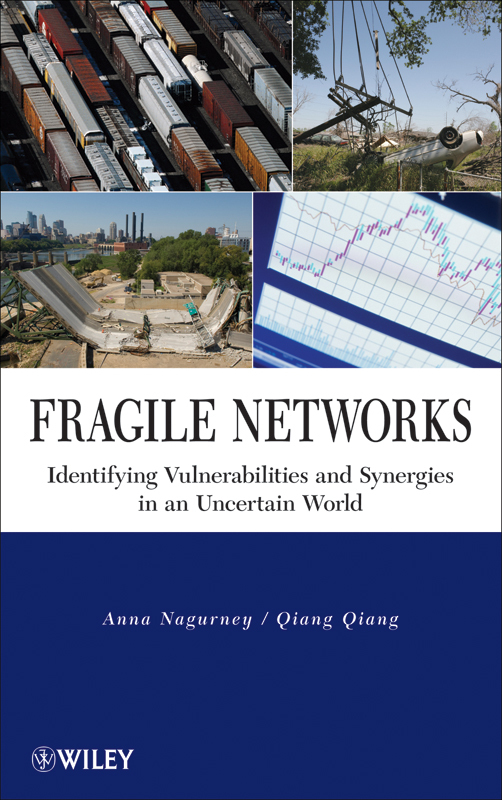 An added bonus is that the Fragile Networks book that I wrote with Dr. Qiang will also be displayedat the conference. Those of us who are in academia get to meet and interact with leaders on the world stage. This can happen through our work, through serendipity, because we tend to travel a lot, and also through various speaking venues. This past Thursday, UMass Amherst was host to Dr. Janet Yellen, the Chair of the Board of Governors of the Federal Reserve system. She has been called the most powerful figure in world finance and she spoke to an audience of almost 2,000 in the UMass Fine Arts Center, beginning shortly after 5PM. She only gives a few public speeches a year, so this speech was eagerly anticipated, and her lecture was the Philip Gamble Memorial lecture. The Gamble lecture series has brought renowned economists to UMass Amherst. Last year the speaker was Thomas Piketty, whom I blogged about, and, in 2011, it was the Nobel laureate, Elinor Ostrom, the first female Nobel laureate in Economic Sciences. She died of cancer in 2012. And, in 2012, Professor George Akerlof, also a Nobel laureate, who is Yellen's husband, delivered the Gamble lecture. His first paper on information asymmetry, which has inspired several of my papers on supply chains and information asymmetry, which I wrote with Dong "Michelle" Li, was rejected 3 times before it was finally accepted for publication in a journal and for this work he received the Nobel prize in Economic Sciences! Our first publication on the topic was: Equilibria and Dynamics of Supply Chain Network Competition with Information Asymmetry in Quality and Minimum Quality Standards, Anna Nagurney and Dong Li, Computational Management Science 11(3): (2014) pp 285-315. Back in 2002, the Nobel laureate, John F. Nash, delivered the Gamble lecture. I have cited his work in probably close to 100 papers that I have written. He passed away last May in a car crash in which his wife also died, having just returned from Norway, where he was awarded the Abel prize from the king. I had the pleasure of sitting during Yellen's lecture next to my great Finance colleague, Professor Ben Branch, and to my husband. Ben had heard Yellen speak a few years back at the Financial Management Association meeting so he gave me an excellent preview of what to expect. She would read from a script and there would be no questions. Professor Michael Ash, the chair of our Economics Department, introduced Yellen and emphasized that she was the first female head in the Federal Reserve system's history. Since her words have so much clout and can literally move markets, her speeches have to be very precise and carefully constructed. Her speech was on Inflation Dynamics and Monetary Policy.. In her speech she emphasized the dual goals of full employment and keeping the inflation rate at 2%. She presented numerous graphs and discussed inflation also from a historical perspective dating to the 1960s. She noted highlights from the Federal Open Market Committee (FOMC). About 50 minutes into her speech, she made what Professor Ben Branch said to me was the newsworthy announcement and that many were awaiting - that the interest rate will be gradually increased. This statement made national and international news including The New York Times and The Wall Street Journal. Shortly, thereafter, she went silent and the audience was completely still, in suspense. She coughed a bit, found her place again, went silent again, and stated that she would end now. Needless to say, we were all very anxious and concerned and as we exited with several students and faculty form the Isenberg School I wondered whether she had been thirsty. I did not see her take a break to drink some water or to catch her breath during about 50 minutes of continuous speaking. We also saw an ambulance stop at the Fine Arts Center. She had been dehydrated and once EMTs treated her, given her impact, this also made news. She recovered and then enjoyed dinner with our Chancellor, Dr. Kumble Subbaswamy, and special guests. Dr. Yellen received her undergraduate degree at my alma mater, Brown University. It is pretty cool that we are both on the same Wikipedia page as notable Brown University alumni. I am under "Academia" and she is under "Advisors." I hope that all is well with her and that the Federal Research system, the US, and the world, can still count on her leadership and monetary policy wisdom. The best part about being a faculty member is working with students. And with the beautiful month of September and the beginning of the new academic year, there is a renewed energy on campus. Faculty who work closely with students are also happiest when their students achieve and such achievements should be celebrated. This past week has been filled with wonderful news concerning students. 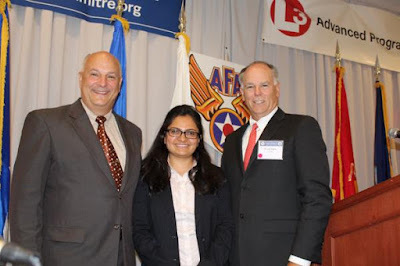 For example, yesterday evening, my doctoral student in Management Science, Shivani Shukla, who had traveled by public transportation - quite the challenge in itself - to our sister campus, UMass Lowell, to take part in the Air Force Association (AFA) Cyber Workshop shared with me some wonderful news. 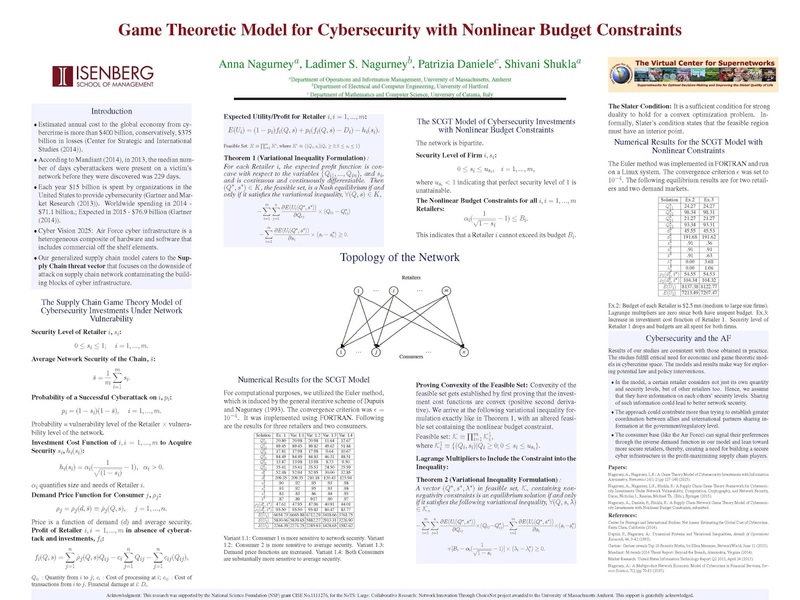 The poster that she had presented, "Game Theoretic Model for Cybersecurity Investments with Nonlinear Budget Constraints," was awarded the first prize in the poster category! 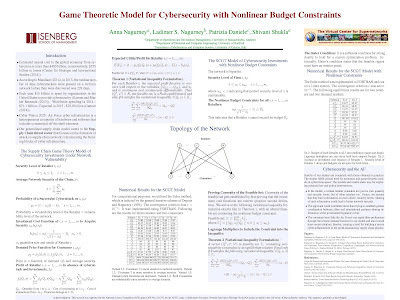 Part of Shivani's poster presentation was based on the paper: A Supply Chain Game Theory Framework for Cybersecurity Investments Under Network Vulnerability, Anna Nagurney, Ladimer S. Nagurney, and Shivani Shukla, which was just published last week in Computation, Cryptography, and Network Security, N.J. Daras and M.T. Rassias, Editors, Springer International Publishing Switzerland (2015) pp 381-398. A nice writeup is here. 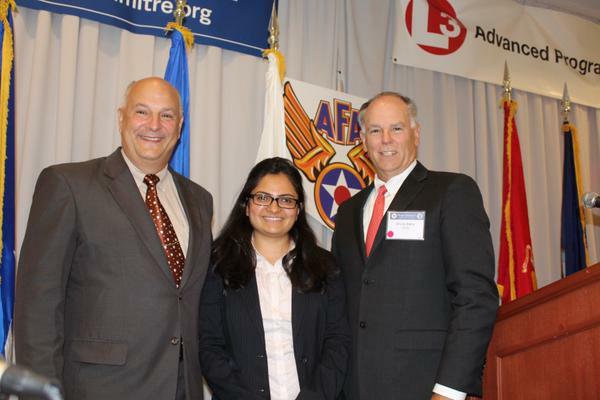 Below is a photo of Shivani with Bruce Baikis from MITRE and Joe Carriere from L3 Communications, who gave her the award. MITRE is also the home base of one of my absolutely favorite INFORMS colleagues, Dr. Les Servi (who is also a fellow Brown U. alum). The prize consisted of a check plus an Air Force medal, which is considered a badge of honor. 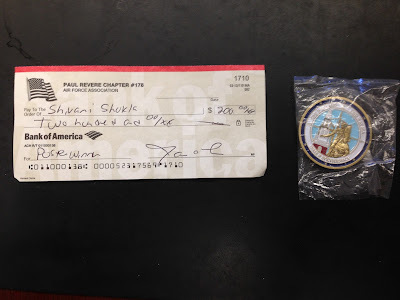 The first prize in the paper category went to Patrick Dynoff, who is a high school student, and has been working with faculty at the Naval Postgraduate School. So impressive! Congrats to all the entrants in the AFA Challenge! Clearly, the way forward with cybersecurity is through research and education, which must include great students! At the Isenberg School of Management and at UMass Amherst our students are fabulous and a delight to work with. Sometimes you feel as though it is a very bad dream and soon you will wake up and the sun will be shining again. Two days ago, on September 20, my husband and I returned from visiting our daughter at her college for Family Weekend. The weather was simply perfect - a gorgeous late summer day in New England. I had an uneasy feeling, for some reason, and checked masslive.com only to find headlines about our Town Manager, John Musante, who is also our neighbor in Amherst. I called out to my husband since I did not want to read the article alone. On Sunday morning, John Musante, loving husband, devoted father, and dedicated public servant of the highest integrity had passed away suddenly. The neighborhood and the town of Amherst will never be the same. Yesterday, we saw several of the family members and we all hugged, trying to understand from our shock this heartbreaking event. Neighbors are visiting one another, stopping to talk at length, in what was always a very caring and wonderful neighborhood. John Musant was only 53 years of age. He left a tremendous legacy in our town and, just last Thursday evening, after a full day of teaching and also taking part in the New England Security Day, which I bloggesd about, we headed to the Amherst block party where we saw John talking to some colleagues of ours. The downtown was closed to traffic and people of all ages were there to enjoy entertainment, food, and companionship. I will always remember seeing John walking his dog "Griffy" past our house, seeing him mowing his lawn, and taking time to chat. We would enjoy talking about our children and the unique town of Amherst, with its type of government, beauty, history, and many wonderful characters. John was the consummate professional, always cool, always pleasant, and extremely hard-working. The photo below (apologies for it being a bit grainy). I took at a big emergency sheltering exercise at UMass Amherst at the Mullins Center back in 2014 in which several of the students in my Humanitarian Logistics and Healthcare class participated. There he is with our fire chief. My students were very excited to see them. John was a UMass Amherst alum and the tributes to him continue to flow, including those from college presidents as well as from the UMass Amherst Chancellor, Dr. Subbaswamy. Our community lost a great person, and our hearts go out to his grieving family members. Rest in Peace, Mr. John Musante - you will always be part of Amherst! This week is only the second week of the new academic year at UMass Amherst and has it been a busy start! Today, after teaching my Transportation and Logistics class at the Isenberg School, I was off to the College of Information and Computer Sciences (newly named) to take part in the New England Security Day (NESD 2015). The program was fantastic with individual talks, a keynote by Jeremy Epstein of the National Science Foundation, and several panels. 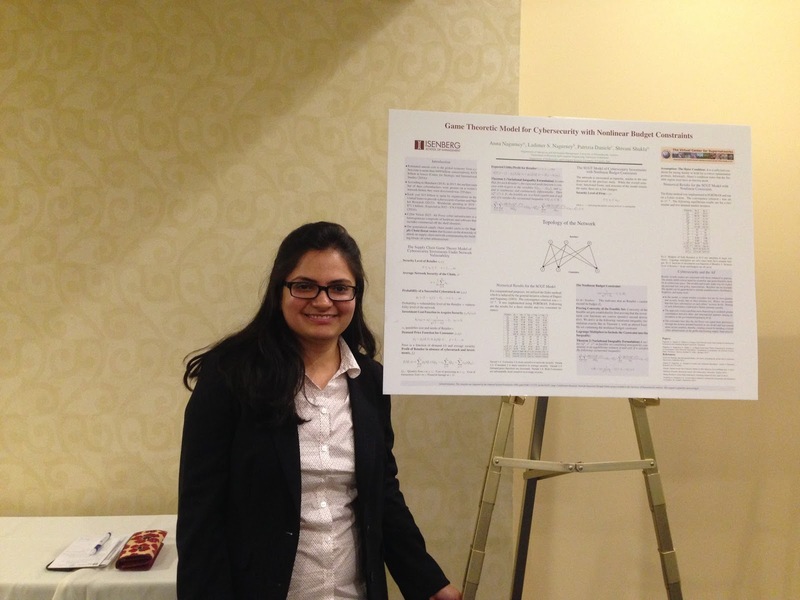 Plus, in the afternoon, there was a poster session. The day began with welcoming remarks by Dr. Brian Levine of Computer Science, who has been spearheading cybersecurity initiatives at UMass, and by our Povost, Dr. Katherine Newman. The keynote by Jeremy Epstein was simply fabulous. It was not only very informative but also delivered with a great sense of humor. The importance of cybersecurity research as well as the challenges associated with multidisciplinary research were highlighted. He also noted the importance of the NSF EAGER program, which I was delighted to hear about since my colleague, Professor Tilman Wolf, and I, with collaborators from the University of Kentucky recently received an EAGER grant. Epstein is a rotator at NSF, has had the position for 4 years, and is stepping down in January. His will be big shoes to fill. There were 115 registrants for NESD and faculty and students came not only from many New England academic institutions (including Harvard, Dartmouth, WPI, Brown University, UConn, UMass Lowell, Northeastern) but also from New York (SUNY Stony Brook) and New Jersey (Rutgers and Stevens Institute of Technology). This speaks to the timeliness and importance of cybersecurity research. Below are photos of the speakers this morning and of the audience. Lunch was provided and was delicious. Dr. Susan Landau of WPI was the first speaker in the afternoon. All the talks were great and it was nice to see female speakers as well as many female students. Several told me that they were so impressed by the number of females in attendance. The refreshments were also perfect - Atkins cider donuts, fresh fruit, veggies, and cheese and crackers. The poster session was also very interesting and a great opportunity for networking. 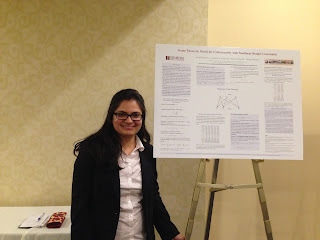 I was very happy that my doctoral students, Shivani Shukla and Sara Saberi, presented posters and, speaking of serendipity, the poster that Shivani presented was based in part on a paper of ours just published today in the new book, Computation, Cryptography, and Network Security, edited by N.J. Daras and M.T. Rassias. Dr. Rassias co-edited another book with John Nash, which will be John Nash's last book. I enjoyed talking with 2 PhD students in Computer Science from Brown University, my alma mater. One of the best aspects of today's event was not only the exchange of ideas but the conversations and the meeting of new colleagues. I can foresee new collaborations because of this event. It was also terrific to work over the summer with colleagues from Computer Science, the Isenberg School, the Department of Electrical and Computer Engineering, and Math/Stats to make this event happen. Kudos also to those in the last session, which still had a big audience because the topics were so interesting. A huge thank you to Professor Brian Levine for bringing us all together for the terrific New England Security Day. Based on the response and interest, I suspect that such an event will be held not once but, possibly, twice a year. Thanks to everyone for a very stimulating and energizing day! Special thanks to Michelle Roberts for the flawless logistics and smooth operation.